The TransPennine rail line between Manchester and York could be the first intercity route in the UK to become digitally-controlled, the transport secretary has said. Network Rail will be given up to £5m to develop technology to "help improve reliability and safety", Chris Grayling said. Critics warn digital rail is expensive and the route needs upgrading. The RMT union accused Mr Grayling of "hypocrisy and hot air". During a visit to IPPR in Manchester, the transport secretary said investment in northern rail services by the government was "misunderstood". He said he wanted the North to lead the "digital revolution on our railways". The plan includes upgrading the signalling system where a computer works out how to route the trains "most efficiently" along the line. If there is a disruption on the line it will work out quicker how to mitigate that delay, a Department for Transport spokesman said. There could also be technology in the train to tell the driver what speed to go at to reach its destination on times, he added. The London Underground already has in-cab signalling on three lines, which means trains can safely run closer together. Mr Grayling said: "Travel will be transformed across the North as we invest £13bn to improve journeys, expand our motorways, scrap the outdated Pacer trains, and spend £55bn on HS2 to cut journey times between our great northern cities." Tony Miles from Modern Railways Magazine said: "It is a mixed traffic railway and there are some old and new trains and the price tag [for digital technology] will be very large. He said train companies were saying there was "not a lot of benefit in changing the signalling" on such a winding route. He added: "Actually, what they need is the route upgraded so the trains can run faster on the tracks that are there and if you are doing that you may as well electrify it at the same time." RMT General Secretary Mick Cash said: "No amount of spin and re-hashed commitments can hide the fact that this secretary of state is both anti-rail and regionally biased. "His speech today just reeks of hypocrisy and hot air at a time when safety and modernisation are being sacrificed in the names of private profit and austerity." He highlighted an ongoing dispute over the role of guards and driver-only trains and urged Mr Grayling to show commitment to rail in the North by "reversing his decision to axe promised rail electrification". The government scrapped planned electrification of railway lines in Wales, the Midlands and the North in July, which shadow rail minister Rachael Maskell called "a slap in the face" for commuters and businesses in the North. However, Mr Grayling said the government's programme of electrification was continuing. "We need to approach electrification not by worrying about how the train is powered but by what service is delivered to the passenger," he added. The Chancellor announced a £450m fund to develop digital railway in the Autumn Statement last year. Major upgrades are already taking place on the TransPennine route as part of the Great North Rail Project, which will see more than £1bn spent on changes across the northern England rail network by 2022. 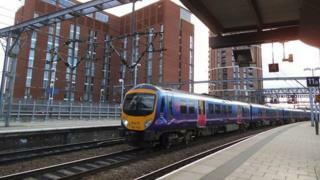 It aims to reduce journey times between Leeds and Manchester to 40 minutes. What next for high speed northern rail?